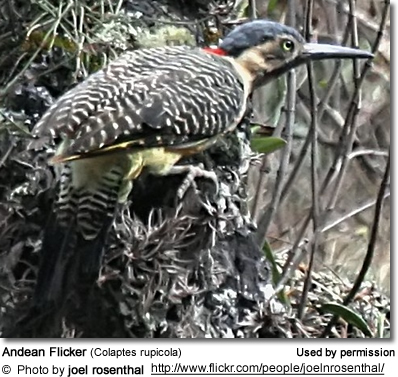 Known as Pitío del norte, its Chilean name in South America, the Andean Flicker (Colaptes rupicola) is a secretive bird; thus very little is known about its habits, particularly in the areas of breeding and feeding. Range: Western, central and southern Bolivia, the Tarapacá region in northern Chile, and the Jujuy province south to the Catamarca northwestern Argentina. Range: Southeastern Loja region in extreme southern Ecuador and (SE Loja) and the Piura region in northern Peru. 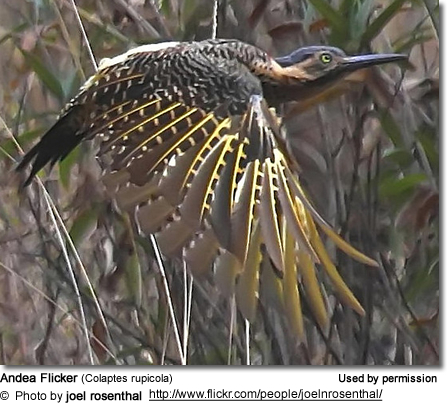 The female lacks both the red patch and the malar stripe. While the upperparts are dark brown with white bars, the underparts are a light grey and the breast is speckled. The crown is dark grey. 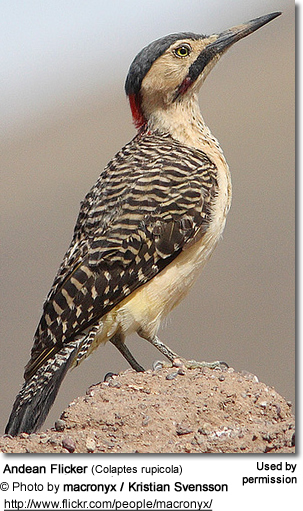 The Andean Flickers feed on various insects, such as ants, and spiders. Andean flickers are a gregarious species within their territories, and they nest in colonies. They build their nest burrows in close proximity to each other; often there are often as many as a dozen burrows in the colony. They require holes in cliffs or road cuttings in which to build their nest burrows. Races are known to interbreed in Peru.